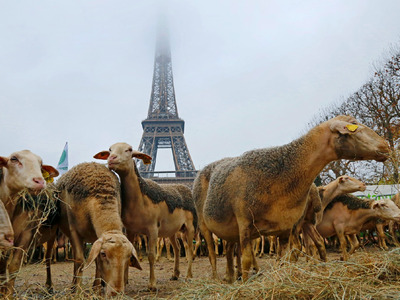 REUTERS/Jacky NaegelenSheep are gathered in front of the Eiffel tower in Paris during a demonstration of shepherds against the protection of wolves in France November 27, 2014. Good morning! Here are the major stories you need to know about before US markets open. Oil Crashes. The major oil price benchmarks plunged over 6% following the OPEC announcement. WTI oil fell to as low as $US67.75 per barrel and brent got as low as $US71.12. Oil Stocks And Oil Currencies Move. Stocks, ETFs, and currencies linked to oil got punished. Underperforming energy companies led Australia’s S&P/ASX down 1.6%. The Russian rouble collapsed to 49.999 roubles to the dollar. Russia Thinks Oil Could Drop Below $US60 Per Barrel. Russia’s most powerful oil official Igor Sechin said in an interview with an Austrian newspaper that oil prices could fall below $US60 by mid-way through next year. Sechin is chief executive of Rosneft, Russia’s largest oil producer. Japanese Inflation Fell Below 1%. Excluding the effect of the sales tax hike, and volatile fresh food prices, Japanese inflation is now at its lowest level in more than a year, prompting concerns about the country’s huge monetary stimulus. Europe Inches Closer To Deflation. Prices in the eurozone climbed at a 0.3% rate in November, down from 0.4% in October. On a year-over-year basis, core prices are climbing at just a 0.7% rate. None of these falling numbers are expected to let up any time soon as oil prices continue to plunge. “We now expect the headline inflation rate to drop below zero at least briefly over the next six months and there is a clear danger of a more prolonged bout of falling prices,” Capital Economics’ Jonathan Loynes said. It Should Be A Quiet Friday. There are no major US economic reports scheduled for release today. The US stock markets close early at 1:00 p.m. ET. German Retail Sales Jumped In October. Retailers recorded a 1.9% increase in sales from September, to October, a better than expected start to a seasonal splurge. Analysts were looking for a 1.5% rise. Mexico’s President Is Effectively Disbanding Local Police Forces. After the murder of 43 students by a drug gang, allegedly with the co-operation of local police, Enrique Pena Nieto is proposing a totally unified Mexican police force. Iraq Says Its Military Is Too Corrupt. Iraq’s finance minister called for deep-rooted reforms to stamp out corruption in a military that collapsed in the face of an Islamic State advance, as he prepares to spend nearly a quarter of the 2015 budget on defence.